CODIGO COLOR, MEMORIAS (COLOR CODE, MEMORIES), explores the complex issue of racism through the memories of the picturesque city of Santiago de Cuba. 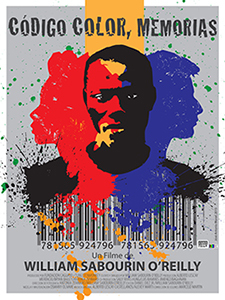 CODIGO COLOR was initially made for Cuban youth who are unfamiliar with the history of racism in pre-revolutionary Cuba. The film is meant to be a catalyst to provoke discussions about the racism of the past and how this past still affects contemporary Cuba. The film approaches the subject from a new perspective using a powerful visual language. Color creates the narrative flow, combined with eloquent archival images, CODIGO manages to transport the viewer to the 1950's, a decisive period in Cuban history. CODIGO interweaves paradoxical and sometimes emotionally searing stories of people who lived through this period with simple physics and artistic theories about the colors that surround us. As human beings, how do we perceive color and how does it affect us? How have interracial relations evolved during the formation of our society? In these complex times, CODIGO COLOR offers a unique prism on our past, helping us to understand the ways we see, judge and appreciate our relationship to color, and the color of skin.